Can Virtual Worlds Save TV ? There have been several forays by TV properties (gradually losing their audience and associated ad revenues) into social virtual worlds over the past two years. I don’t just mean branded one-off events but actually setting up shop, building a familiar and representive space for the ‘users’ to play in. These forays range from at one end, simple branded spaces pushing episodes on screens through to actually running variants of the TV format to be played out by participant avatars in a detailed build -with many points in-between. But before the meat of the post (a couple of new entrants) here is a quick list to give you an idea of some of the shows and channels that have tried, had some success or failed. As I have been involved in a few of them and visited all, I have listed ones I think have had most impact (engagement) through to those who didn’t quite get it (reversioning). many more…0ver to you and comments! There is a rule of thumb regarding TV execs and virtual worlds or serious games initiatives – do not let the TV folk take control as they have too much ingrained baggage around non-participatory media and the resultant compromise is often of no use to anyone – get people who understand game play (and be aware that often excludes traditional game developers) and social media involved or face the consequences. The ones above that really worked allowed the participant audience to really ‘live’ in the shoes of the characters either by having activities similar to the protagonists, meeting the ‘fictional characters’, a social space that resonated with the shows aesthetic or a great set with game-like elements. I have talked a lot about Mixed Reality Entertainment in the past and how one of the most innovative uses of virtual space is to extend the TV or Film property into a 24/7, participatory environment. The main reason for doing this is to drive traffic to the TV but also to keep existing followers loyal to the branded property. 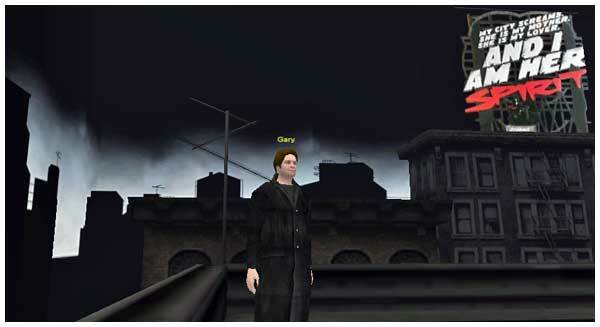 As an example there is more detail about the reasoning on my post on Big Brother (good and bad) in Second Life (Witnessing the Birth of an Entertainment Form) as well as posts nearby on CSI in Second Life and many of MTVs properties in There.com (TV Property Branded Virtual Worlds – The Beginning). There are moves around the world including BBC and many European broadcasters who are creating worlds alongside and in some cases in front of the TV episodics and this is the important point. Promoting films with games or virtual world spaces has a very limited life span, forging a strong link between virtual world events and TV episodics is to me a virtuous circle – especially considering the 200 plus worlds populated by the youth audience who are typically turning off TV – teens and tweens. Earlier there were many experiments of TV/World hybrids and I was involved, as mentioned before, in the Mirror. Here is John Wyver (then Illuminations) talking about that (remember this is circa 1997!). The other key element that contributed to the success of The Mirror, much as in real life, was the provision of regular “hosts” for the space. These needed to be frequent visitors who spent a significant amount of their time in the world, and whom users could have some reasonable expectation of encountering when they logged on. These hosts would greet new entrants, introduce people to each other, point out activities and generally help people around. More than this, however, over time they became the core of the community of the world, encouraging people to return and beginning to develop the particular language and culture of The Mirror. Needless to say, they were the saddest to see it turned off after seven weeks – although a number of relationships begun virtually have continued in the real world – including at least one marriage and one recently born child. The agreement was brokered by the William Morris Agency and marks the first time ‘Heroes’ has partnered with a virtual world. ..but not in the usual way. As reported by LA Times “‘Heroes’ hops on to Habbo’s virtual world” they will be introducing a virtual-only character Syn Anders who will act as a bridge or guide to the TV series. NBC themselves give more detail here. While following directions from a mysterious virtual messenger, the new character will take the audience on an adventure as she discovers the history of ‘Heroes’ through a journey that travels back and forth between Habbo.com and the ‘Heroes’ Evolutions site. “We’re excited to work with Habbo to introduce a new character that will extend the enormously popular and EmmyÂ® Award winning ‘Heroes’ interactive story beyond the official Web site on NBC.com,” said Stephen Andrade, senior vice president, Digital Development and General Manager, NBC.com. On Habbo.com, fans of the show will be able to interact with the new virtual hero through a variety of in-game activities. Habbos participating in a weeklong quest will discover their own special powers and will be recruited as new heroes. Those who successfully complete the mission will be awarded various virtual prizes. On the ‘Heroes’ Evolutions site, the new virtual hero will be woven into several of the in-universe, interactive extensions of the on-air show, including a character profile, the Primatech Paper Assignment Tracker and new chapters of the ‘Heroes’ graphic novels. 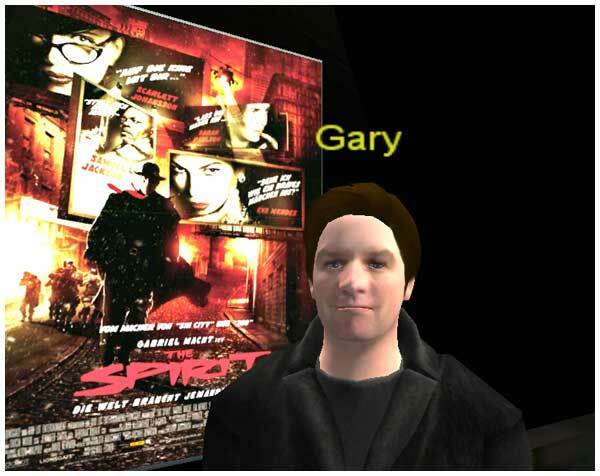 Onto Twinity and the images here and above are me playing around in the pre-build set of the recently released and not universally praised film The Spirit. Although it grossed $10 million in the first 4 days it was pulled up for being unemotional and 2D. Well part of the problem generally with many big features now is that audiences have changed and want something more experiential – especially with ‘comic-noir’ films – why not let them ‘live’ in the story environment (my wikipedia item)? Twinity though have teamed up with Will Eisner studios to do this event (not in any way my ideal episodic but potentially a way for the Twinity user base to ‘create episodic, comic-noir’ machinima on-going? CineStar Spirits you Away to Another World – CineStarâ€™s CUBIX cinema in virtual Berlin is the premiere address for all movie-related events in Twinity. The cinema is currently showing the trailer and other exciting movie material from the upcoming premiere of The Spirit, a movie based on Will Eisner’s cult 1940s comic book series, which will be coming to a cinema screen near you from 5 February. Fans of the movie can get their hands on exclusive Spirit merchandising: including posters, standees, and an incredible Spirit mask that lets you see special visual effects inworld. Find more information here. Save the date and come to the opening party! 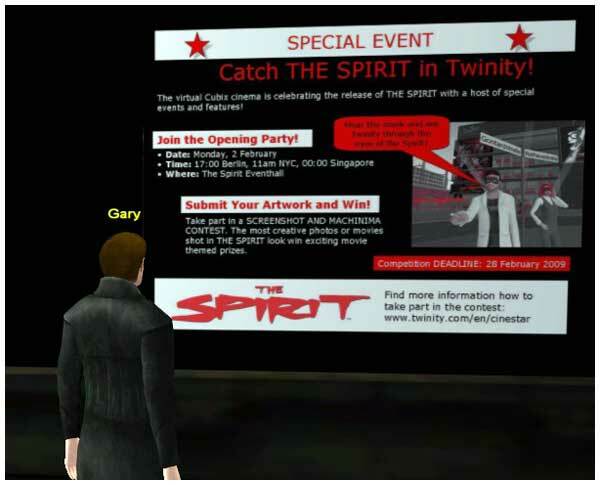 Twinity (by Metaversum, the German created virtual world) are a long ways from a mature stable platform, hence being in beta for the past 12 months or so, but are already exhibiting the best ‘world-led’ event-based, user activation. This in my mind is high on the list of reasons for likely success over many of the areas that over-hyped Second Life suffered from in the early days. OK the world is quite big and empty and many ‘social’ tools are not yet available inworld but the kind of activity quoted below (calling for videos, images, stories etc: attached to some well know brands) is great first step community building and more importantly getting a growing community to market for you. Even I had a go at one a few months ago – video embedded below 🙂 BTW Metaversum you really need to improve the video tools (detached camera please!). Submit Your Artwork and Win! – Take part in The Spirit Screenshot and Machinima Contest and win an exclusive film poster signed by cult film director Frank Miller or The Spirit action figures. Wear the mask and see Twinity through the eyes of the Spirit! – Use Twinityâ€™s screenshot and recording tools to create incredible Spirit- inspired images! To be eligible to win the contest, screenshots must be created while wearing the Spirit Mask and its â€˜visual effectsâ€™ must be demonstrated in your machinima. Screenshots may be submitted in jpg, png or gif formats. Weâ€™ll celebrate the winning entries with a Winnerâ€™s Gallery party in the CineStar Event Hall! Artwork will be displayed in the CUBIX cinema during The Spirit promotion. Keep an eye on Twinityâ€™s Event Calendar for further details! Of course I would encourage all TV producers to think about their current audience and whether they want to reach them this way. More importantly you need to think of the appropriateness of creating inworld characters or environments for them to exist in – serious games (from documentaries) and childrens episodics are hot ones at the moment . The real effort is more about having great characters that are persistant in the space but beware of bots or NPC’s (non player characters) pretending to be real, this can have a strong counter productive effect. More later.